There’s a first time for everything, and this was the first time for me making a quilt! Granted, it’s a simple quilt and not very big – but I did it and I loved it! I got the pattern/directions from the current issue of Quilts & More that’s put out by Better Homes & Gardens. (Seriously love these magazines!) I loved the log cabin style and thought it’d make such a fun boy quilt! I went thru my fabric stash and was delighted to come up with this color combo – perfect for the little boy it’s intended for! 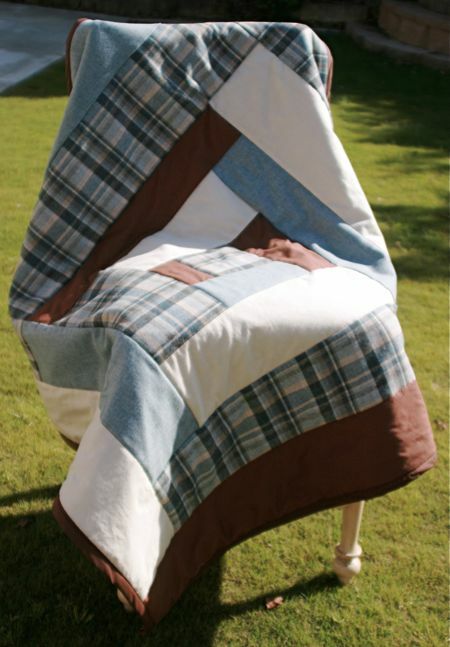 The quilt is backed with brown fleece for softness, and has a low batting inside. I did the “stitch in the ditch” technique to quilt it on the machine – first time ever! It was pretty easy and I like how you see the fun log cabin pattern on the back of the quilt. Trickiest part was the binding, which I think I’ll be able to do better next time. But you know I couldn’t just give a quilt …. I HAD to make Peter Puppy! 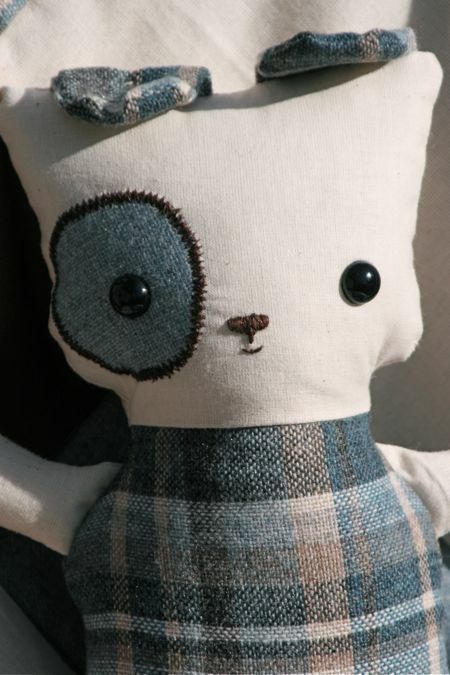 You can find this darling pattern here, along with many others that are so cute that you won’t be able to stand it: Bit Of Whimsy I have SO many of her patterns, each one has AWESOME directions with photos to help you along the way! 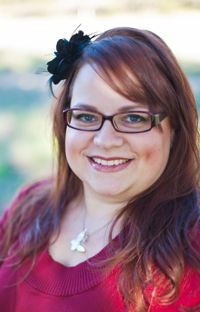 And I must add that Sarah herself is super sweet and helpful! This guy turned out so cute, that I got orders requests from my boys for one of their own. Since this is intended for an infant, I used safety-eyes and inserted a rattle blank inside when I stuff him. My Sister-in-Law Katie came up with the genius idea to use some interfacing in the ears and tail when I was wishing I had a way to make them crinkly! So now he’ll make all kinds of noises and be a tactile delight at the same time! I’m really pleased with how this set turned out! I love the fact that I was able to match the puppy to the quilt and I can’t wait to mail this away to the intended recipient! 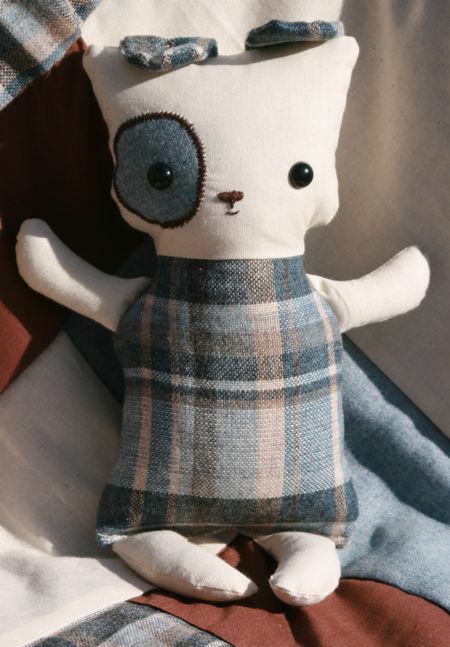 Just going to make a couple of bunnies (Bailey Bunny to be exact) for the other two cuties in the house where it’s going! I’ve in kind of a “photography funk” since my computer went belly-up causing me to kiss a year’s worth of photos good-bye, but I see me getting back into the groove. I should have some more projects to share later this week! Emily, they turned out great! Peter Puppy is just too stinkin’ cute! So adorable Emily! Love the quilt and little Peter Puppy!!!! 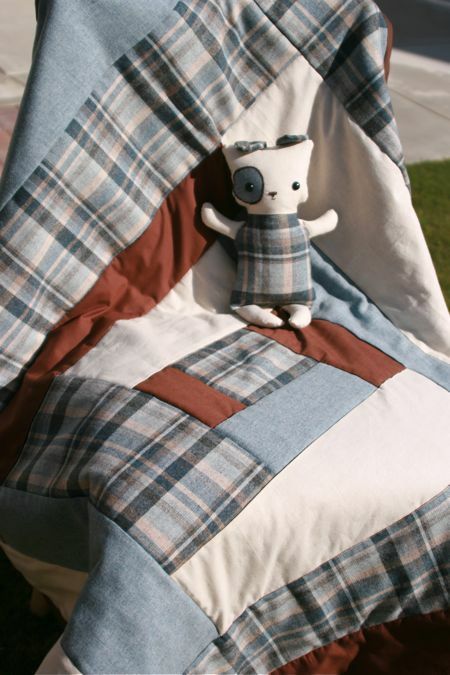 Ohhhh… I love the quilt! Nice and boyish without being typical boy! Just my style. 😉 Peter Puppy turned out quite handsome! Wow Em – you have multi craft skills for sure! Great job! Great job! So adorable! Love them! This is just about the CUTEST thing I’ve ever seen!!! I hope it’s going where I think it’s going. You are so nice and thoughtful to do these things, Emily. Keep learning more tricks, cuz you just keep getting better and better at this talent thing. Oh my goodness!! That is the cutest little puppy! !